Most Chinese will not be unfamiliar with the above patriotic song which was written for the Taiwanese film “Victory” (梅花) (1976) by its director Liu Chia Chang (劉家昌) and that basically summed up the characteristics of Prunus Mume and the importance of this flower in Taiwan. If you are do not understand Chinese language, you may want to refer here for its Chinese Pronunciations and English translations. Plum blossom is highly appreciated and admired for its early (January to March in central and southern China) blossoms, Prunus mume has enjoyed great popularity in China and Japan for centuries. It is popular as a bonsai and a ‘must’ in every Japanese-style garden. The world famous Kairaku-en garden in Japan, for example, boasts 3,000 specimens including 100 different cultivars, which create a feast for the eye during the ‘plum blossom’ season in late February/early March. Due to its long history of cultivation and cultural significance, there are more than 300 known cultivars in China, which differ mainly in the color of their flowers (which can be white, pink, red, purple or light green). The triple grouping of stamens (one long and two short) represents Sun Yat-sen’s Three Principles of the People (namely nationalism, democracy and socialism (民族主義, 民權主義 and 民生主義)), while the five petals symbolize the five branches of the ROC government. (Source: Taiwan President’s Office’s website) namely Executive Yuan, Legislative Yuan, Judicial Yuan, Examination Yuan and Control Yuan. 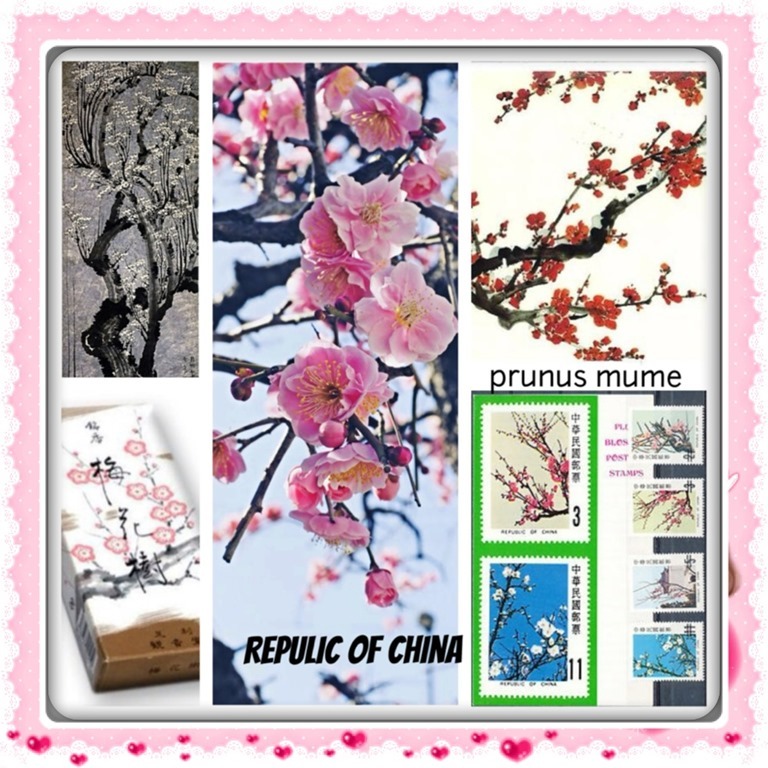 Common name(s) : mume, ume, mei flower, Chinese plum, Japanese apricot. Plum blossom tree is related to both the plum and apricot trees. Although generally referred to as a plum in English, it is more closely related to the apricot. The fruit ripens in early summer, around June and July in East Asia, and coincides with the rainy season of East Asia, the “meiyu“ (梅雨季节, literally “plum rain”). Those who live in East Asia will knew that during this season, the whole area will become very damp and mold will appear in household items from kitchen condiments to leather jackets etc.. The fruit of the tree is used in Chinese, Japanese and Korean cooking in juices, as a flavoring for alcohol, as a pickle and in sauces. It is also used in traditional medicine. Ume vinegar is a traditional digestive aid produced from Prunus Mume. Its sour and salty taste stimulates the production of saliva and stomach acids, which in turn help the body to break down and assimilate the nutrients in the food. Try it as a condiment on soups, stews, vegetable and grain dishes to absorb more nutrition and eliminate indigestion. You can read further: here. Plum blossom is a flower not only important in Taiwan ROC but also have a huge cultural impact on Japanese and other Chinese communities. In fact, it is also another prime candidate considered for the national flower of People’s Republic of China. You can read my earlier post: National Flower of People’s Republic of China where the peony is deemed to be the unofficial national flower. In Chinese, plum blossom it is one of the flower representatives associated with the four seasons namely orchid for spring (春蘭)、bamboo for summer(夏竹)、chrysanthemum for autumn (秋菊)、plum blossom for winter(冬梅). The combination for these four flowers, collectively called “four flowers gentlemen”, also a Chinese painting favorite, denotes four characters that a gentleman should possess. Plum blossom signifies ability to withstand hardship as it blooms in the cold winter: orchids symbolize modesty, beauty, joy and purity; chrysanthemum reminds us that it is possible to triumph when the going gets tough and to be brave when faced with adversity and lastly bamboo represents upright and continual growth (梅寒盛放，蘭花清秀，菊花淡香、竹子節節上升). Flower Plum blossoms don’t have any split at the end of the petals. Cherry blossoms have a small split at the end of each petals. Bark The bark on a plum tree is darker and does not have distinctive horizontal line on it. The bark of the cherry tree often have small horizontal lines on it. Flower Bud There is only one plum blossom coming out of the bud. More than one cherry will come out of a cherry bud. Leaves Plum blossoms have small purple leaves that are unrolling although some species do have leaves that are green The leaves of cherry trees are green and unfolding. 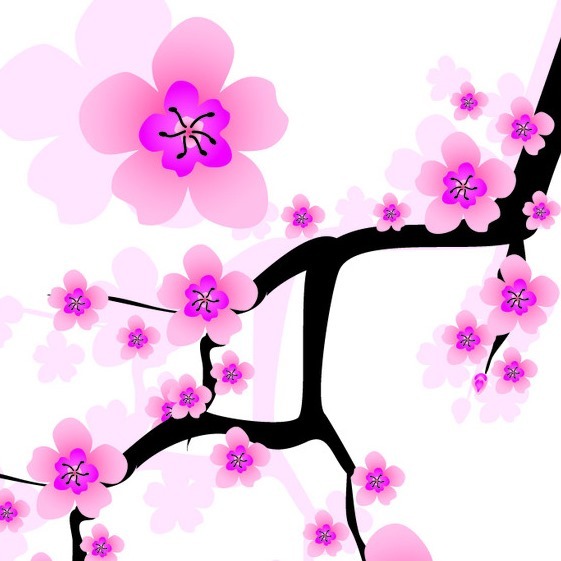 You can refer to this website if you are interested to have a visual differentiations between plum and cherry blossoms. How about taking up another challenges to differentiate these two blossoms with the third blossom, i.e. peach blossoms (桃花）? This entry was posted in National Flower Series and tagged 1, cherry blossom, china, CHINESE, japan, National Flower Series, plum, plum blossom, prunus mume, taiwan, ume. Bookmark the permalink. ← What is this series–7?